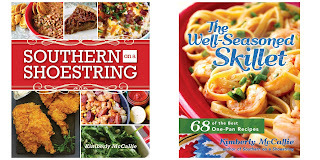 Both of my cookbooks are currently available on Amazon. 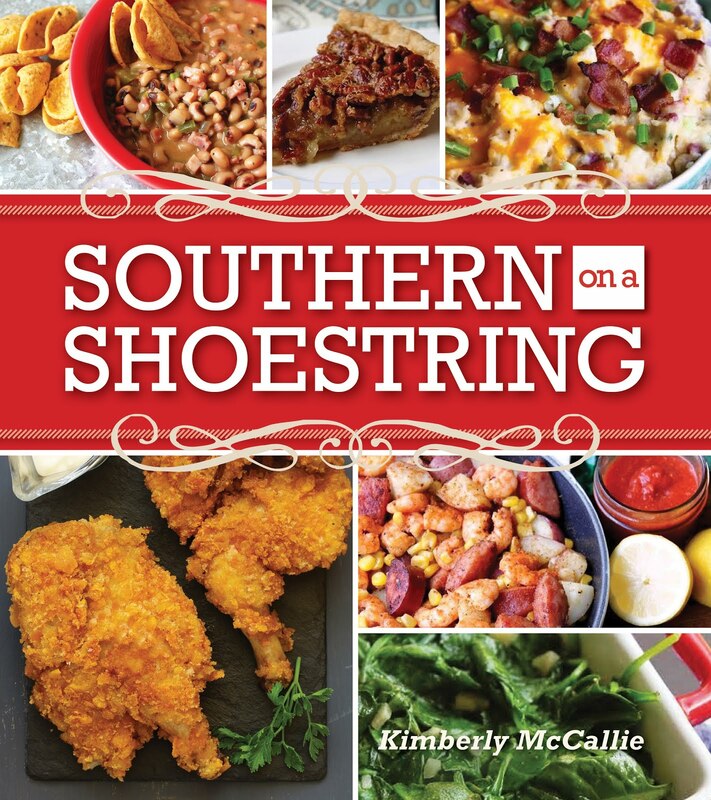 This recipe is from my favorite magazine, Southern Living. Please visit the original recipe here for the full, printable recipe and for more information. Sometimes, I will see a recipe for the first time and it's like the heavens open up and a radiant light shines down on me. 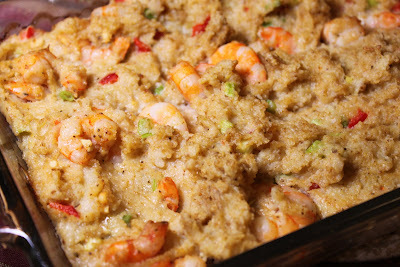 That's what happened when I saw this recipe for Shrimp and Grits Dressing from Southern Living. It sounded wonderful and perfect for Thanksgiving dinner. Last weekend, I decided to do a test run just to see how it would turn out. I had my fears that the grits would be too dense and rubbery. But, it was absolutely perfect and I made another batch Thursday morning. I, of course, had to make a few changes (improvements) here and there which I'll share here with you. This was a huge hit when I unveiled it at our Thanksgiving dinner yesterday. My cousin had seen the recipe in this month's magazine and just had to take a photo of it and send it to her friend. All of the shrimp-eaters in the family loved it. And, I think you will, too. I always cut up my veggies before I start cooking. I just like to have them waiting for me. The first time I made this recipe, I used the amounts given in the original recipe and made an 11"x7" dish. I knew I would need more to feed a bigger crowd, so I used 50% more ingredients to make a 9"x13" dish for Thanksgiving. I used four eggs plus a tablespoon of water in the larger recipe. Otherwise, everything else increased by 50% rather easily. 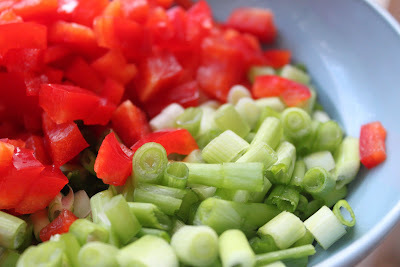 In addition to the red peppers and green onions, I stretched the larger batch with a half of a green bell pepper. I changed the original recipe by adding a couple of cloves of chopped garlic and 1/2 tsp. 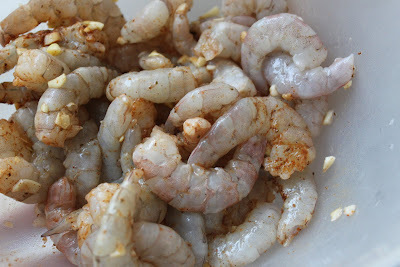 of seafood seasoning to the shrimp before incorporating them into the dish. I just wanted to add a little extra flavor. Words cannot express how absolutely amazing this tastes! Even if you don't like grits, I want you to try this. 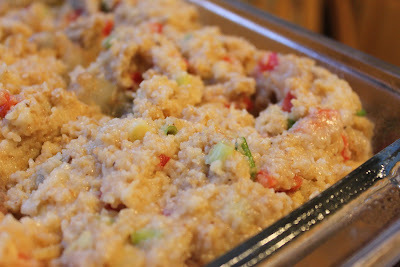 The grits were moist and flavorful and the texture is truly that of dressing. I believe I have started a new Thanksgiving tradition. I hardly think I can show up next year without this dish. That could lead to an uprising of historial proportions! 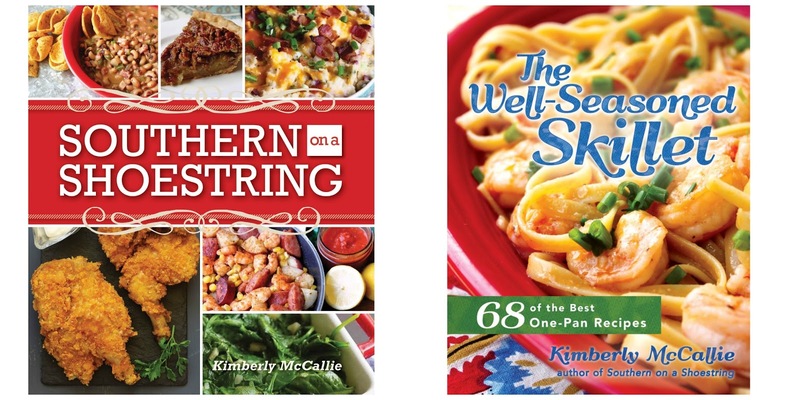 It looks as if you did a fabulous job Kim! Congrats!! I am so glad your Thanksgiving holiday was a success! Like you, as soon as I saw this recipe I knew it would be added to my Keeper Recipes! I made it, served it and it was loved! Thanks for sharing this recipe...a great tasting dish that is fairly simple and affordable. Simple and tasty! I bookmarked this page. Can I make it a day in advance ? You should be able to assemble it in the casserole dish and refrigerate overnight. Give it a few extra minutes when you bake it to compensate for it being cold. Thank you so much for the prompt response, it's going to make thanksgiving day a lot less hectic. If anything like shrimp and grits, I will love this dish. I can't wait to try it! Did you put one teaspoon of salt in the recipe or 1½ teaspoons? Yes, please clarify how much salt you used? The only thing I see that I would have to experiment with is using corn meal instead of breadcrumbs to make this like a more traditional southern "dressing". The grits and the cornmeal would work in harmony to make this dish truly a "new tradition". I like your idea but since cornbread has added flour, I think I would do half & half or 1/4 corn meal & 3/4 bread crumbs. 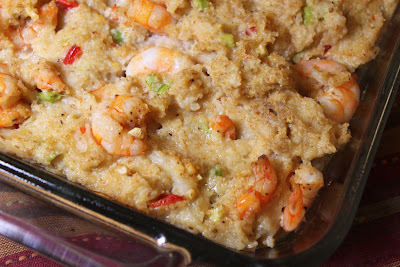 Oh Lord, I didn't see the cheese at the bottom of the ingredient list, please disregard my comment and thanks for sharing, I desperately want some shrimp and grits today and will be making this!! I made this and it is sooooo good! I added more salt as you suggested and it was perfect. Next time I'm going to add the Old Bay seasoning and maybe use some crumbled cornbread instead of bread crumbs. I give this recipe a 10! i have to try cooking this. Does the long cooking time not make the shrimp rubbery? Thank you, can't wait to try this dish! Oooh Yea I'm trying this! I hate to repeat the question, but in you narrative, its says you added a teaspoon of salt to the original recipe. So is the total amount of salt to use 1 teaspoon or 1 1/2 teaspoon? Sorry I didn't answer your question correctly. One teaspoon all together. If i use quick grits, do I need to change the cooking time? I don't think so since the grits are fully cooked when adding to the casserole.